I have served as a Representative since November 2002 in District 14 of the South Carolina House. In that time, we have fought a continual effort to advance Second Amendment rights while defeating attempts to curtail those same rights. It requires a majority of both the House and Senate to do either. My first meeting with any group as a legislator was with Anthony Roulette, regional representative for the NRA. I drafted constitutional carry and have been working to get it passed since that time. As time passed and I earned trust, others followed my lead and we made progress, however I quickly learned that bills died in the Senate. We did make progress passing The Castle Doctrine, Preemption, and many others along the way. Preemption blocks confiscation of legal firearms by local officials as occurred in New Orleans post Katrina. I led bird-dogging these bills through both chambers with the help of senior legislators like, Gregg Delaney, Murrell Smith, and Brian White in the House and Larry Martin and Glenn McConnell in the Senate. In those same sixteen years not one anti-gun bill has passed. We only had reciprocity with 7 states for our CWP, neither of which was with our sister states of Georgia and North Carolina. This created a problem for our constituents along both borders. Today, we have reciprocity with 23 states including both sister states. Only two groups were involved in the passage of these bills, The NRA and state affiliate Gun Owners of SC. There is always a Johnny-Come-Lately and ours is Palmetto Gun Rights (PGR) supported by Freedom Action Network (FAN). PGR makes bogus claims of accomplishment while actually becoming a DETRIMENT to gun rights. They have NEVER been directly involved in the passing of ANY pro-gun legislation, NOT ONE. 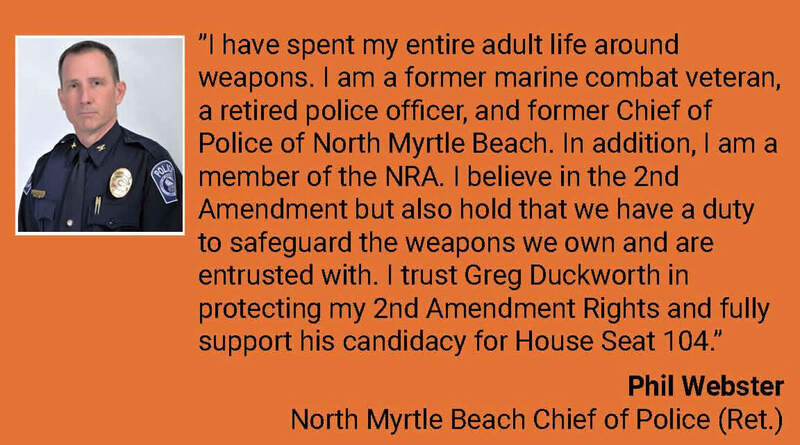 Palmetto Gun Rights has demonized me and Rep. Greg Duckworth as anti-gun, saying that we hate the Second Amendment, although our accomplishments and awards tell the truth. Let me dissect a couple of examples: Constitutional Carry and Reciprocity. Reciprocity is a reciprocal agreement between two parties. Reciprocal meaning both ways. For CWP, South Carolina will recognize any state that recognizes our permit. A bill was on the floor in the House that recognized any states CWP whether they reciprocated or not. This was unfair to our constituents, so we amended it to true reciprocity. The majority of the SC House passed this amendment and then the bill. It died in the Senate this year. PGR and FAN have unfairly attacked Representative Greg Duckworth over the amendment. What is constitutional carry? The Second Amendment confirmed by the US Supreme Court says I have the right to keep (own) and bear (possess) arms. Bottom line, I have a right to self-protection individually and collectively. This means I do not have to be permitted by the government to exercise my right. The debate even among gun rights groups is not the right to carry but how to carry. It is not defined in the bill of rights. Open Carry or concealed carry becomes the question. I carried a sidearm openly as a Military Policeman and as a civilian police officer. I spent hours practicing firearms retention, yet officers sometimes are shot with their own weapon after having it taken. The battle over gun rights will not be decided by pro- or anti-gun advocates. It will be decided, like most issues, by those in the middle, many of who believe in my right to self-defense but are frightened by the sight of a gun. Why ostracize that group? The House passed my permit-less carry bill giving anyone who could legally possess a handgun to carry concealed without a permit. It too died in the Senate. PGR has attacked myself and other NRA ‘A-rated’ House members over these two bills. PGR says we should have passed recognition of any state whether they recognize ours or not. I disagree, it is not fair to SC CWP holders. They want open carry or nothing, I and most in law enforcement disagree! I want to carry without government interference even if it must be concealed. 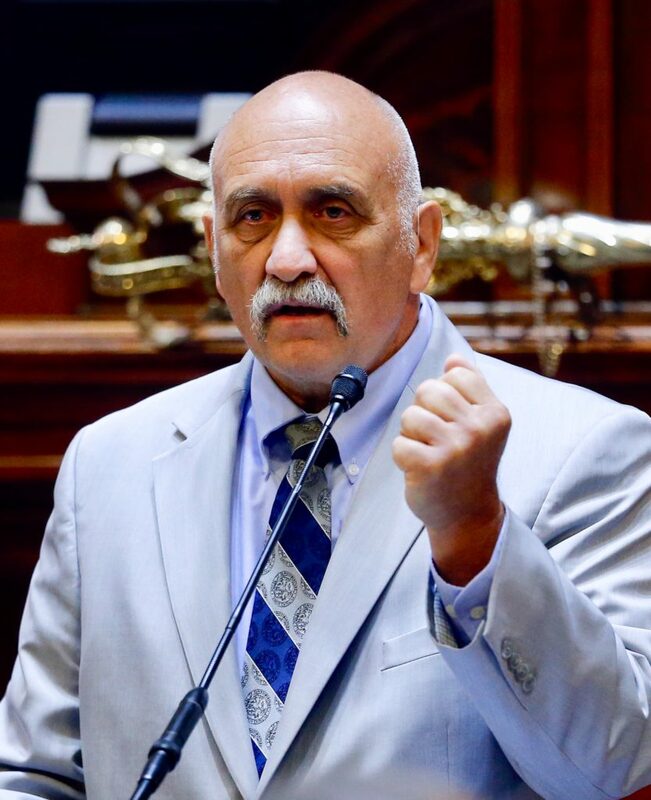 Palmetto Gun Rights and Freedom Action Network are attacking pro-gun House members over a procedural vote on H. 3700 filed by Representative Jonathan Hill. Hill, by procedural move, attempted to bring his bill straight to the floor bypassing the important committee process. Committee proceedings are the only opportunity for testimony to be heard. This move was rejected by the Chairman of Judiciary. Hill stated he could not get a hearing on his bill. Yet, he could have gotten a hearing by simply requesting in writing to the chairman – which he FAILED to do! The House did pass, by large margin my bill, H. 3930 which was also co-sponsored by Rep. Greg Duckworth. The difference between the two bills was open carry versus concealed. The Senate has clearly stated no open carry bill will even get a hearing. The problem is visibly NOT in the SC House. Palmetto Gun Rights even invented an award this year, the so-called “Fifty Caliber Award”. This sounds like a really big award considering the size of a fifty-caliber round. The inaugural recipient was Jonathan Hill. In four years Hill has only had one bill pass subcommittee and that was a license plate bill. He has passed NO GUN LEGISLATION, so I can only consider the Fifty Caliber Award to be a participation trophy. The National Rifle Association is under full-scale assault because the anti-Second Amendment crowd knows the NRA is really the ONLY organization blocking their agenda while Palmetto Gun Rights attacks pro-gun legislators and then asks for your money in every communication. PGR and FAN are attacking Representative Duckworth and his track record of supporting the Second Amendment while trying to replace him with another INEFFECTIVE puppet like Jonathan Hill. Do not be MISLED, Rep. Greg Duckworth is ‘A-Rated’ and Endorsed by the NRA! Thank you for taking the time to learn the truth, it must be told! Please share this message with your family, friends, and neighbors.